Named for its 17th- to early 20th-century owners, the Salvin Hours is one of the largest and most richly decorated English books of hours. Its decoration, created by two artists, resembles contemporary wall paintings in the Oxford area, suggesting that it was made in a workshop there. Its original owner probably was a high-status person living in Lincoln because it also resembles 13th-century books of hours associated with that city. It lacks a calendar, which would have helped to locate its original place of use because it would have listed saints' feasts special to a particular place. 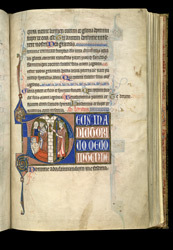 This page gives prayers for lauds (daybreak) in the Hours of the Trinity, a set of meditations included in some English 13th-century manuscripts. In place of the scenes from the life of Christ that it gives the Hours of the Virgin, events from the lives of saints are depicted. The first letter of the prayers presents a scene from the life of St Nicholas. The picture compresses time so that St Nicholas hands out almost simultaneously gifts which he gave over three nights. His gifts saved a poor man who was considering drastic action involving his three daughters to ease his poverty. Having nothing to do with the content of the prayers, the picture of Nicholas gives a model of Christian virtue.